On March 10, 1880, Commissioner George Scott Railton and seven women officers knelt on the dockside at Battery Park in New York City to give thanks for their safe arrival. 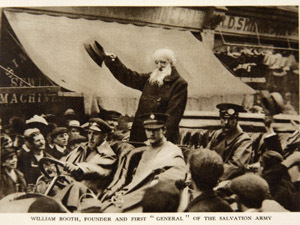 At their first official street meeting, these pioneers were met with unfriendly actions, as had happened in Great Britain. They were ridiculed, arrested, and attacked. Several officers and soldiers even gave their lives. Currently, The Salvation Army is led by General André Cox, from International Headquarters in London, England.